Over the last couple of years our work on various microservices platforms in the cloud has brought us into close collaboration and engagement with many customers and as a result we have developed a deep understanding of what developers struggle with when adopting microservices architectures in addition to a deep knowledge of distributed systems. A major motivation for joining Oracle, besides working with a great team of very smart people from startups, Amazon and Microsoft, was the opportunity to build from scratch a platform based on open source components that truly addresses the developer. In this initial blog post on our new platform we will describe what was driving the design of our platform, and present an overview of the architecture. Moving to microservices is not an easy transition for developers that have been building applications using more traditional methods. There are a lot of new concepts and details developers need to become familiar with and consider when they design a distributed application, which is what a microservice application is. Throw containers and orchestrators into the mix and it becomes clear why many developers struggle to adapt to this new world. Developers now need to think about their applications in terms of a distributed system with a lot of moving parts; as a result, challenges such as resiliency, idempotency and eventual consistency, just to name a few, are important aspects they now need to take into account. In addition, with the latest trends in microservices design and best practices, they also need to learn about containers and orchestrators to make their applications and services work. 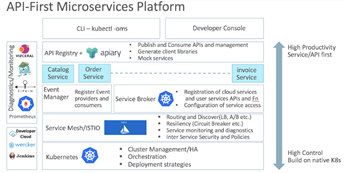 Modern cluster management and container orchestration solutions such as Kubernetes, Mesos/Marathon or Docker Swarm are improving over time, which simplifies things such as networking, service discovery, etc., but they are still an infrastructure play. The main goal of these tools and technologies is to handle the process of deploying and connecting services, and guarantee that they keep running in case of failures. These aspects are more connected with the infrastructure used to host the services than the actual services themselves. Developers need to have a solid understanding of how orchestrators work, and they need to take that into account when they build services. Programming model and infrastructure are entangled; there is no clear separation, and developers need to understand the underlying infrastructure to make their services work. Read the complete article here.